England were bowled out for 281 in reply to Australia's first innings 136, a lead of 145 runs, on the second day of the third Ashes Test at Edgbaston today. Joe Root top-scored with 63, while Moeen Ali made a dashing 59 after Ian Bell's 53 yesterday. Australia off-spinner Nathan Lyon took 3 wickets for 36 in 13 overs, with Josh Hazlewood claiming a couple of late wickets in his three for 74. England, after losing the toss, had bowled Australia out inside 37 overs yeterday, with James Anderson taking an Ashes-best 6 for 47. At lunch, England were 221 for seven. 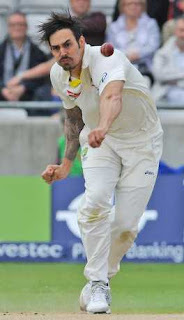 Australia's Mitchell Johnson took his 300th Test wicket. England began the day on 133 for 3, with Joe Root 30 not out and Jonny Bairstow unbeaten on 1. Bairstow gave England the lead when he square drove Josh Hazlewood for four in the first over of the day. But next over Johnson got Australia right back into the match with two wickets for no runs in three balls. Bairstow exited for just five as he gloved a brute of a rising ball from Johnson to wicket-keeper Peter Nevill.